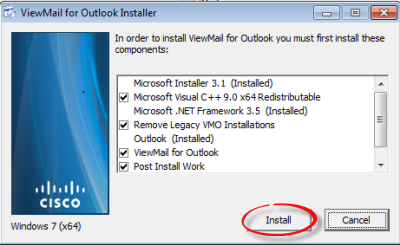 Use Cisco ViewMail to manage voicemail from Outlook 2010. This is not available to Mac OS based computers. It is also not yet available for use with Outlook 2013. Step 1:Check the bit version of Outlook 2010. Open Outlook and click the File tab. Select Help. 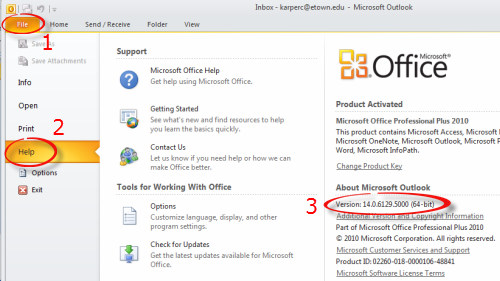 The bit version is listed under About Microsoft Outlook (it will be either 32 or 64). You may close Outlook. Step 2:Double click on Computer on the desktop. 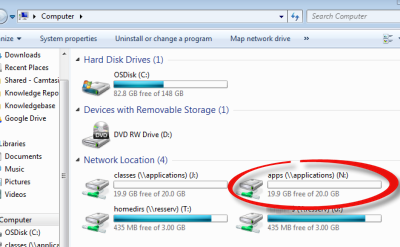 Step 3:Open Apps (\\Applications) (N:) from the network drives. Step 4:Double click Cisco Phone Apps. 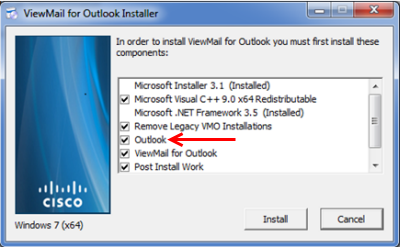 Step 5:Double click Cisco ViewMail for Outlook. Step 7:Open the appropriate folder for the bit version of Outlook that you checked in Step 1. Step 9:Right click on setup.exe. Select Run as administrator. Step 10:If prompted, enter your username and password. Step 11:Click Install. Note: If Outlook is checked, you selected the wrong bit version in step 7.